A survey conducted by the state government in 46 forest and wildlife divisions has pegged the population of Royal Bengal Tigers at 40. The government took up the tiger estimation nearly one and a half years after the release of National Tiger Conservation Authority's (NTCA's) all-India tiger estimation report, ostensibly to counter its statistics. The NTCA had put the Royal Bengal Tiger number at 28, four less than the 2010 census. The latest census, whose report was released by the principal chief conservator of forests (wildlife) Siddhant Das here on Wednesday, shows that the Similipal Tiger Reserve alone has 26 tigers - nine males, 14 females and three cubs. Other divisions, such as Karanjia and Keonjhar, have three tigers each, while Khariar and Sundargarh have one each. 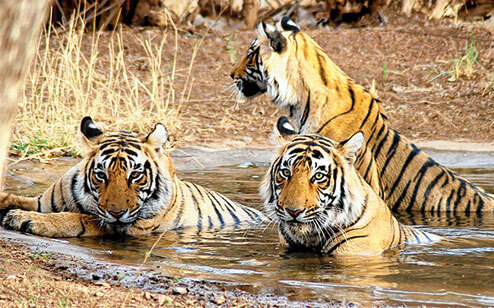 Satkosia Tiger Reserve has recorded the presence of two Royal Bengal Tigers, while Sunabeda Wildlife Sanctuary in Nuapada district has four big cats. Official sources said both pug marks and camera trap methods were used for the counting. In the first phase, the census was conducted from February 5-10 and in Similipal alone it was repeated from April 17 to April 30 by installing 420 camera traps. Two technical committees headed by former field director of Satkosia Tiger Reserve Anup Nayak and additional principal chief conservator of forests(wildlife) Sisir Acharya analysed the input of the census to get the correct figure. Since the NTCA's report showed a decline in tiger population, much to the disappointment of the state's wildlife wing, the government disputed it. In the first phase, the wildlife wing came under criticism for using outdated pug mark method. Then, after a gap of two months, it decided recounting in Similipal. "The survey has been conducted in extremely fair manner and it shows the exact number of big cats. Except Sunabeda sanctuary, all the divisions were provided with camera traps for the counting," said Das. The census also reveals that camera traps captured three melanistic tigers in Similipal, which claims to be the only reserve in the world to have such tigers. The government also came up with a leopard count. According to the census, there are 318 leopards in various forests and sanctuaries in the state. Of the 318, there are 144 males, 154 females and 20 cubs.